Number order up to 10. 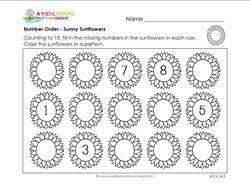 Fill in the missing numbers in the sunflowers. Sequence beginning with numbers other than one. Number order up to 10. 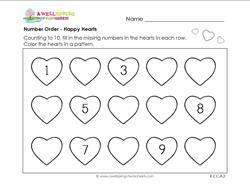 Fill in the missing numbers in the hearts. Sequence beginning with numbers other than one. Color in a pattern. Number order up to 10. 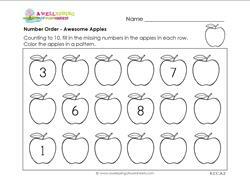 Fill in the missing numbers in the apples in each row. Sequence beginning with numbers other than one. Color in a pattern.